Two-month-old Roman has a very special place in his mother’s heart. It is because the little boy has brought the joy and smiles back in her life after a tragic house fire killed four of her older children two years ago. 45 year old Rachel Henson calls her little boy a miracle baby and one who brought meaning back into her life. The mother dealt with a heavy blow two years ago when Tommy, nine, Alisha, six, Rocco, four, and two-year-old ­Appolonia perished in a house fire. Rachel says this year’s Christmas is vastly different from last years for her when she could not bear to celebrate without her children. “But this year I have a beautiful baby boy who has given me a reason to live again. He really is a little miracle. 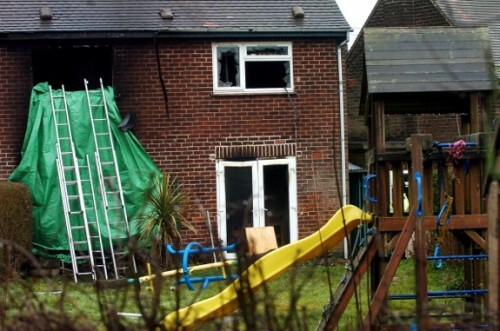 It was in January 2011 when a stray spark from a newly installed fireplace triggered a blaze in their family home at Hulland Ward, Derbyshire. The family slept as their house was soon engulfed in fire. Rachel was woken by Tommy who noticed the black smoke. When she tried to coax the boy to jump from the bedroom window, Rachel herself accidentally fell out into the garden. Fire fighters arrived at the house, but were just not in time to save the four children. She also fondly remembers what each of her child was like and loved to do. “Appolonia was like a little princess. She loved anything pink and girly. And Alisha loved having a baby sister. She would play mum all the time, helping me to wash and dress her. The two girls would later play dolls together and loved dressing up. Rachel met her fiancé Clint three years ago. She says the family used to love celebrating together whether it was birthdays, Christmas or New Year. Her children’s last Christmas was as special as each year. “Every year I always bought a 7ft real tree and the kids would all ­clamber round to help decorate it,” she says. “Tommy and Rocco would place the baubles while Alisha would carefully wrap tinsel around it. Appolonia’s job was to turn on the lights. Her little eyes would twinkle and she would clap her hands excitedly. Quite a contrast, two days before last year’s Christmas, Rachel had to deal with her children’s inquest when the coroner also criticised her for having drank wine the night of the fire. It was only when Rachel was recovering in Derby Royal Infirmary that she learnt about her children. Rachel and Clint moved away while the house was being rebuild, but have moved back in March. She says it was difficult but had to be done. It was a hug shock for her when Rachel found that she was pregnant. She says she finally has something happy to focus on. When she gave birth in October, it was like bring happiness back in her life. “I just cried and cried. I had so much love stored up I could now give to my son.